Spiliotica Villas is located in Imerovigli village, on the Caldera of Santorini island, just one kilometre away from the capital of the island, Fira. It offers a breathtaking view to the island, the volcano, the rock of Skaros and the Venetian capital which is below the hotel. The sea lies under the hotel terrace, from where one can see ferry boats or cruises passing by and of course the famous Santorini sunset. Spiliotika Villas is an ideal place for travellers looking for a relaxing holiday. Spiliotica Villas consists of 13 studios and 7 suites for 2-3 or 2-5 persons, built according to the traditional santorinian style and furnished with elegant Greek antiques. Spiliotica studios: They consist of a private bathroom with a hairdryer, a kitchenette, a bedroom with big comfortable beds. Studios for three persons include satellite TV and daily cleaning service. Spiliotica nano studios: (nano means dwarf in Greek) They are double studios where everything is in small size apart from its double bed and the windows with an outlook over the sea, while being in the bed. Moreover there are mirrors on the ceiling. Spiliotica suites consist of a private bathroom with a hairdryer, a kitchenette, and a library with various international books and a bedroom with big comfortable beds. All suites of Spiliotica have magnificent sea view. Ira and Ermis Suites consist of a double bed a sofa bed each one. There is a Jacuzzi and a nice furnished balcony with a great view to the sea in each suite. Afroditi Suite consists of a double bed a sofa bed. It is a small and elegant apartment full of small Greek antiques, marble bath with a jacuzzi and a beautiful living room. It offers all the facilities of a luxurious apartment. Its three apartments are interconnected with an interior stair made of rock. Athina Suite consists of 2 double beds and a sofa bed. There is also a jaccuzi and a living room while its veranda is furnished with comfortable armchairs. Archontiko Suite consists of 2 double beds, a sofa bed and a jacuzzi. It is a traditional cave house furnished with antiques. There is a living room and a bedroom with a traditional wrought iron bed offering an ideal romantic setting. It was originally a house hewn out of the rock earlier this century. Its living rooms, kitchen, bathroom and verandas are furnished with impressive Greek antiques. Reviving all the charm and warmth of the past, it will take you back in time. Kaisaras Suite consists of 2 double beds with jacuzzi. It is an one-space suite which accommodates up to four persons. There is a large living room, with fireplace in its centre, decorated with Greek antiques, paintings dated from 1813 AC and a rock at the back of the room. Kaisaras Suite offers the visitor the chance to meet the Cycladic tradition. 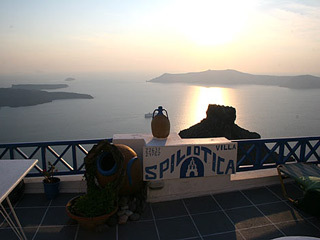 Its terrace is seems to hang over the Caldera with a magnificent view to the Volcano, Santorini island and Aegean Sea. Spiliotica Villas offers to honeymooners its Spiliotica Honeymoon Suite or its Spiliotica Archontiko honeymoon Suite which includes a Jacuzzi.